Bullfighting - Bullfight - Bull. Bronze sculpture. 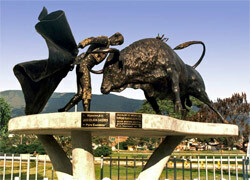 "Germán García Cardona, an outstanding veterinarian, graduate of the School of Veterinary Medicine of the University of Caldas, is also well-known today as a sculptor who specializes in “arte taurino”, or bullfighting art. He was drawn to such art because of his great fondness of and loyalty to the “fiesta brava”, which has made him internationally famous and respected in the world of bullfighting." "Making a biographical sketch of Germán García Cardona as a friend and aficionado of the bullfight is not an easy task… "
"There are very few times that life gives us the splendid opportunity to talk about a friend that has achieved the pinnacle of happiness, if we take this to mean the capacity of being who we really are. " "We have here a self-educated man, who because of his fondness of bulls and bullfighting decided to trade his veterinary knowledge for that of sculpting." "His greatness is divine, his art is divine. Olé for the true sculptors!" "The sculptures of his bulls are the essence of perfection that a self-educated man can aspire to." 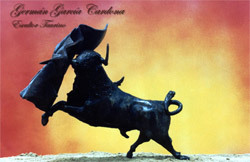 Germán García Cardona, an outstanding veterinarian, graduate of the School of Veterinary Medicine of the University of Caldas, is also well-known today as a sculptor who specializes in “arte taurino”, or bullfighting art. He was drawn to such art because of his great fondness of and loyalty to the “fiesta brava”, which has made him internationally famous and respected in the world of bullfighting. Like any good professional he acquired a scientific and technical skill of animal anatomy and the sketches and drawings that he did during his student and intern days were very promising exercises that would later take three-dimensional shapes. His enthusiasm and love of bullfighting became a fever and caused him to stop his veterinary practice so he could dedicate himself full-time to the thorough study of bullfighting art. He began to take pictures at the bullfights that he attended, capturing in the camera the most interesting and exciting moments of each bullfight, concentrating on the movements of the bull and bullfighter, and giving equal importance to both as should be done. He is also known for his work as a taxidermist, with the most outstanding pieces of the collection being the heads of young bulls that are exhibited in the Plaza de Toros of Cartagena and in other private collections. 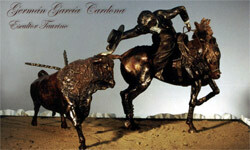 García Cardona uses bronze to sculpt his works of art of the bullfighter and bull in the midst of the fight. His artistic sensibility poured into bronze gives the sculptures a sense of force that in the bullfighter reflects his surrender, bravery and art; and in the bull, his breed, wickedness and nobility. He has been invited to exhibit his works in various cities in this country and Madrid, Sevilla and Málaga, as well as Nimes, Arles and other cities in France. Today we recognize and pay homage to the life and work of this sculptor. In this way we exhibit his art to the public, artists, art critics and workers of this culture, who will have at their disposition a valuable material which will allow them to enter into the fascinating and magical world of the “fiesta brava”, the bullfight. bullfighting does not have any bullfighting ring, the closest now being the Plaza de Toros in Cartagena de Indias. The implacable wandering of time continues and I keep seeing up close not only the great aficionado, but also the professional: veterinary doctor, outstanding surgeon in the specialty of dogs and cats. But behind that , the gladiator, capable of sharing time between his profession and his love of the bullfight, which brought him to all of the cattle ranches on the Atlantic Coast where there were bulls that would be used in bullfighting. As a practical aficionado, I saw him act with what we call “sobrados” for those brave people that attempt to demonstrate their knowledge and skill. At this time he began to carry a camera, with which little by little he began to show talent for capturing a throw, goring, or simple picture postcard at the precise moment. Germán has a valuable “video bullfighting library” that was created with the effort of his invaluable fondness for the art and the support of friends that had the desire to delve deeper every day into the world of the “toro bravo”. I became aware of his taxidermy skill when, in my debut as a “ganadero”, I saw with surprise the heads of the bulls from my ranch that had participated in bullfights at the Plaza de Toros of Cartagena, stuffed almost to perfection, when they were being exhibited in the Plaza. Later on in 1997, I learned that Germán had also stuffed the head of the first steer of mine that had participated in a bullfight, in the “Cañaveralejo” bullring in the city of Cali, in memory of our beloved and unforgettable Carlos Borráez. Apart from all of this, I had the fortune that Germán García was my friend and a great taxidermist, who with his work recreated the valuable breeding bull “Ramito”, imported from the Cebada Gago ranch in Spain, who died after falling from a high slope on my ranch in Bogotá. And when I say “reconstruct”, I say it because in the great rush of not letting the bull’s hide get damaged, it was cut very badly; but thanks to his experience, that beautiful head is in my living room, alive, expressive and imposing. This man keeps working at taxidermy and has also stuffed the heads of the bulls from “Las Ventas del Espíritu Santo” ranch that fought in Cali and Medellín in 1998. And to the joy of those of us who know and love him, he still is living strong after suffering two serious heart attacks. What a believer, what a passion for life, what will to overcome, what talent, what marvelous hands…Now God wants all of those who love the bullfight to admire the work that he started in 1994; to be able to see these magnificent works of bronze, the material known as “the flesh of the immortals”, like la Cacerina of Medellín and other smaller formats that have been exhibited in Colombia, Spain, France, the United States and Japan, among other places. As a colophon, I want to say that I know all of the bullfighting facets of Germán García, because from a great distance I’ve followed all of the abatares, tasks, sadness and happiness that bullfighting means for this great Colombian that is proud of being so, and in whom all of the qualities and characteristics of the true aficionado come together. There are very few times that life gives us the splendid opportunity to talk about a friend that has achieved the pinnacle of happiness, if we take this to mean the capacity of being who we really are. What does a man bring to the encounter with himself? The search for happiness that will be the answer. In the case of Germán García Cardona it is obvious, and how great that it has been like this; not only for himself—which is the most important—but also for those of us that are with him, those of us that have been nourished by him, by his love of life, his generosity, his way of being (truly Paisa) just like the big Antioquia, land of the pioneers and personalities that surely rocked his cradle. Paulo Coehlo says that “every person can have two attitudes in his or her existence: to build or to plant. “Those that build may take many years, but one day they finish what they were building. Then they stop and find themselves trapped by their own walls. Life loses its meaning when the building stops. “Those that plant also suffer with the storms and seasons and they rarely rest; but unlike a building, a garden never stops growing. And at the same time that it requires the attention of the gardener, it also makes life a great adventure for him”. Because of this, today I again thank Germán García Cardona for this splendid opportunity to thank him for his brotherhood, which is a word of respect and reverence, a word of prayer and hope. It is the rarest form of love, the least selfish form… friendship. We have here a self-educated man, who because of his fondness of bulls and bullfighting decided to trade his veterinary knowledge for that of sculpting. He fiddled with clay in a get-together at Mi Casita and made a small bull’s head. It was so good that he insisted on sculpting small bulls, maybe remembering that he already had international fame as a taxidermist, since he had stuffed an entire bull that the “taurinos” of Barranquilla loved, where Peña El Prado was founded. That bull was at the Hotel El Prado for some time, and then it was taken to Japan, where people admire it in a department store. 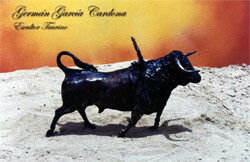 “Rincones taurinos”, bars and even offices have bulls’ heads in them that have been stuffed by Germán García. But big sculptures were what he really wanted to do. His first major work was La Cacerina, at La Macarena bullring, which was destroyed twice by vandals. His exhibits in Medellín, which were supported in part by the authorities and fans in Cali, Manizales, Barranquilla, Cartagena and several Spanish cities, have received excellent reviews. 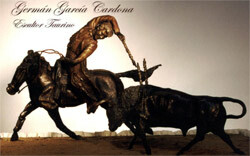 He is finishing a life-sized bull and plans on doing other works, including sculptures of rejoneadores. Health problems, now thank God overcome, prevented him from taking his works to Madrid, Sevilla, Málaga and other Spanish bullrings. Exhibits already slated for Nimes, Arlés and Mont de Marsan in France mean that his works are going to become even more internationally known, which for Colombian art is as good as Germán García himself. His love of everything “taurino” links him to the art that he loves most, everything that has to do with the marvelous and colorful world of bulls. This graphic exhibit is only the beginning of the artist, since we have much to look forward to from his restless personality. Today when deserving respects are paid to some of his works, Germán should feel the same excitement that he dreamed about feeling when he wanted to be a victorious torero, dreaming about his adventures when he was known as Chorizuelo, as he was then called. It is said, and Germán García proves it, that behind every man is a great woman. His wife Vicky has been and will always be such a woman; because in her the voice of art and the passion of her husband have not only found their most faithful admirer, but their strongest promoter as well. Germán, a kind and affable man, as any good “Caldense”. I understand that as a boy he fell in love with the most beautiful of celebrations, El Toreo. This has been the reason for his existence. Every once in a while with a sword and muleta in hand he faces death, “toreando” one cow or another on his friends’ ranches. This love made him a taxidermist, where the heads of “toros bravos” that forged histories in the bullrings remain as if they were alive. Maybe, for the aficionados, but I don’t think for himself, he decides to dedicate himself to sculpting, logically sculpting bulls. Very quickly he has developed his own style, and day by day, exhibition by exhibition, a “gypsy” feeling emanates from his veins and the bull in the country or in the bullring acquires a divine dimension. His greatness is divine, his art is divine. Olé for the true sculptors! It has never even occurred to him to compare himself with Mariano Benlliure or Sebastián Miranda. Those who like sculpting and painting, with more curiosity and love for the art than technical knowledge, will see in Germán García someone very much like Juan Cristóbal, the Spanish sculptor profiled in an ingenious way by Antonio Díaz Cañabate in his book Tertulia de anécdotas. Germán has always looked at daily worries with disdain. His monetary disinterest is one of his characteristics. The sculptures of his bulls are the essence of perfection that a self-educated man can aspire to. His love of the “fiesta” and everything that is related to it have made him study the genealogy of the “toro bravo” very consciously, so he could give his works a very natural aspect. When he asked me to write something about his works, we became aware of what an extraordinary artist and courageous man this is. Today he faces life with the eagerness of the novice bullfighter, in spite of having suffered heart attacks like gorings in the thigh. With new hopes and his ever-present eagerness, he is preparing to present his new work, in which—to the delight of the aficionados of the rejoneo—he dedicates beautiful sculptures exclusively to this art. His horses remind us of the monumental statue of the Cid Campeador, sculpted by Juan Cristóbal in Burgos, where it seems that Babieca is flying instead of galloping, carrying Don Rodrigo brandishing his sword. Germán, who has had a second chance, is a man who is happy with his accomplishments. He keeps his faith in the future and happiness. He hopes to live many years, because just like the bullfighters, he says that his best work is yet to come. Text taken from "ESCULTURA TAURINA" done by Medellin city hall for the expostion realized in the capital of Antiocia in 2000.